Designers will use the power of human-centered design to effectuate social change. Designers must recognize the challenges around implementation and deliver an actionable solution with clear implementation plans. Inspiration Phase: Learning directly from the people you’re designing for. Ideation Phase: Absorb and make sense of the information, identify opportunities for design, and prototype any possible solutions. Implementation Phase: Bring the solution to life, and eventually, to market. For this project, I had the luxury of working with Alyse Gilbert, Evangeline Hsiao, and Greta Harrison. This is the first time we would be working with one another. We were teamed up to tackle the topic of “Factory Farming” — something each of us were very passionate about. Government subsidies, lack of EPA regulations, and agricultural monopolies entrench the current farming system. What can individuals and communities do to encourage the development of environmentally and morally sustainable farming practices, minimize food safety risks, reduce the amount of antibiotic abuse, improve animal welfare, and empower small farmers? I would take lead on the ideation and creation of the final deliverables as well as the journeys/user flows. The work would be dispersed amongst the team, but I would be responsible for maintaining consistency and ensuring the final deliverable presented professionally. Pen/pencil+paper, whiteboards, Google Forms, Sketch, inVision, OmniGraffle, Keynote, QuickTime, iMovie. To tackle a subject as broad as Factory Farming, we went directly to the whiteboard to brainstorm ideas building out an affinity map. Focusing on the environment bubble, we wanted to focus our energy on alleviating the issues surrounding waste and industrial agriculture — areas where we not only felt the most passionate about, but where we felt we could potentially drive the most impact. We broke down the traditional model we have in existence — how your typical produce travels from where it is grown to your local grocery aisle — and depicted it visually. This obviously does not cover every single step in the process but from what’s highlighted, we can get a relatively clear understanding of the key points. Before we dove further, wanted to take a closer look at user behaviors and habits. This would provide us with a human element in the equation, allowing us to emphasize and form a deeper connection. Not only would we be solving a social issue, we would understand “why” and most importantly, “who” we’re solving it for. With the data points collected from the survey, we were able to build some personas to humanize our project. Exploring alternatives to traditional industrialized farming, we learned about the grassroots movement of urban farms around the world. The definition of urban farming or urban agriculture “is the practice of cultivating, processing, and distributing food in or around a village, town, or city.” Since our team all reside in a large metropolitan city (Los Angeles), we felt this would be a potential solution worth exploring further. We felt we needed to get a first hand look at urban farms — the benefits and the potential solutions they provided. Fortunately for us, we were able to locate two urban farms (Lazybones and The Cook’s Garden by HGEL) in the Santa Monica area close enough to our GA campus. Lazybones was a small boutique store with an outdoor garden built by Farmscape, California’s largest urban farming venture. They utilized a plot of land next to the store to construct an urban farm. Cook’s Garden was a larger-scale urban garden. Many local restaurants are currently renting out plots within the garden to grow fresh herbs and other produce for their dishes. But is it scalable? According to research we’ve done and speaking with resellers of the tower, what you can grow in 43,560 square feet (or one acre of land), you can grow in only 4,000 square feet with the tower gardens. One tower can grow anywhere from 20–44 produce items and if you are using a tower with a capability of growing 44 plants and had 40 towers, you theoretically could grow up to 1,760 different plants. Growing vertically allows you to grow so much more compared to growing out. This would make sense considering the already limited space in metropolitan areas. 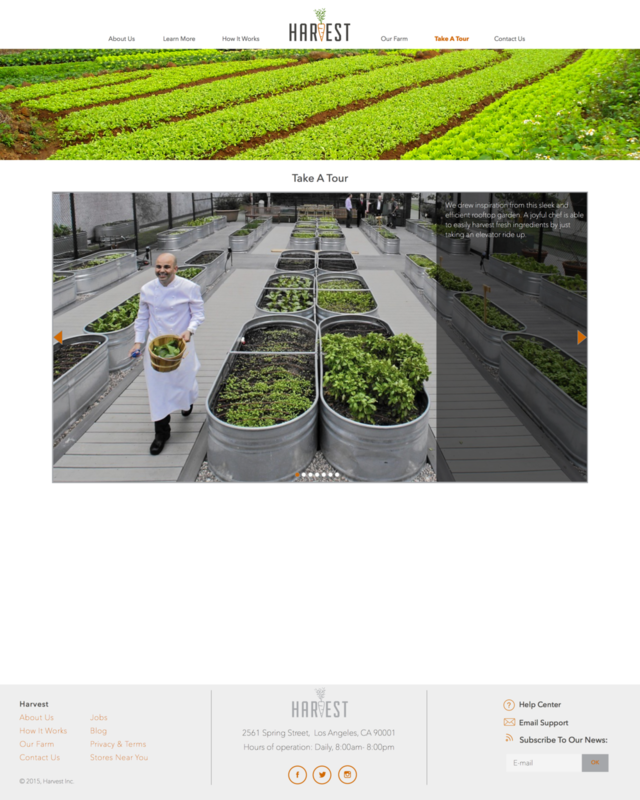 Inspired by the urban farms we’ve visited on-site as well as researching existing plant growing technology (hydroponics/hydroponic towers/aeroponics), we knew we had the potential to create an unique experience. What if we could grow everything in-house and what if we could allow our shoppers to handpick their own produce if they choose to? This sparked our imagination to think outside the box. Understanding the methodology and technology behind urban (indoor) agriculture and what’s possible, we wanted to create an experience like no other. In our proposed flow, all of the produce would be grown in-house with low energy usage and low water waste. There would also be no need for transport as everything is grown in-house. To help us get a better understanding how our market’s shopping process worked, we storyboarded how we imagined a shopper's visit to the store would be like. 1. Shopper would visit Harvest like they would any market. 2. The first time seeing such a place would “wow” the shopper as he or she is able to see rows and rows of fresh produce growing. 3. They are able to interact with the produce…seeing them in various stages of growth, smelling the freshness, and touching them as well (carefully of course!). 4. Shopper can pick the produce they want and “harvest” straight from the plant. 5. Items are placed in a basket we provide them upon entering. 6. Produce is weighed at the end. 8. Shopper happily goes home with their fresh produce purchase. Since there was no way for us to build this in the timeframe we were given (not to mention zoning regulations, funding, and construction), we still wanted to show our audience what we had in mind. We took to the internet and pulled pictures (both real and conceptual) of the designs that inspired us. For the structure itself, we imagined it to be on rooftops in the city. We would be utilizing space more efficiently than if we were to take up ground space. One existing rooftop farm we drew great inspiration from was Lufa Farms, based in Montreal. We felt that they captured many of the ideals important to us. Having a greenhouse-type structure existing in an urban environment also lends to greenspaces, breaking up the monotony of a concrete jungle and providing a more natural environment for its denizens. For the interior itself, we would utilize the plant tower technology — saving space and offering a more environmentally conscious way of growing. 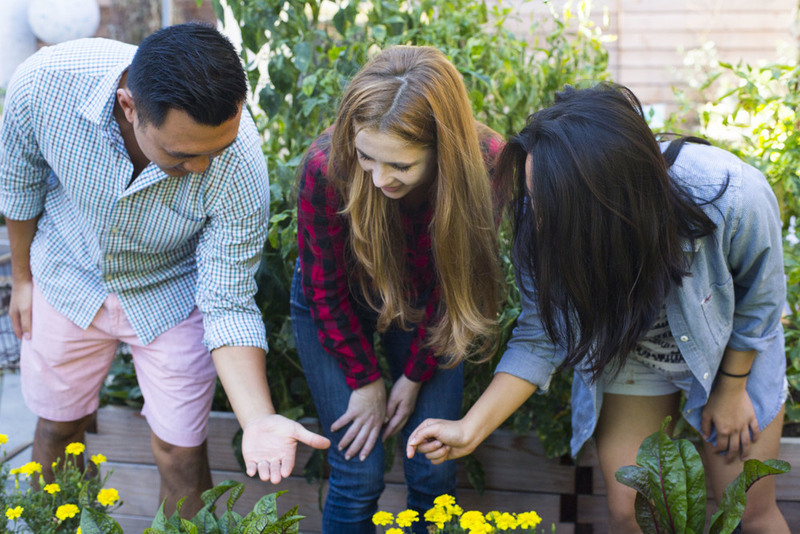 By putting shoppers closer to nature and closer to where their food comes from, we are hoping it will instill a much stronger sense of community and respect for what they put into their bodies — not to mention a unique shopping experience. With the lack of a physical construct, we decided to offer a few screens to show our audience what the website of our conceptual market would look like. Our unique shopping experience and market needed a name. We all wholeheartedly agreed on the name “Harvest” as it embodied our philosophy. 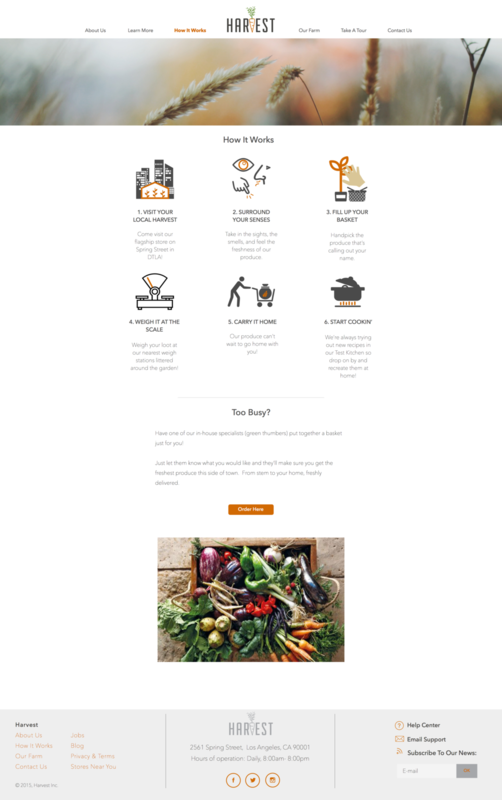 We envision a world where there is no divide between food and our daily lives. 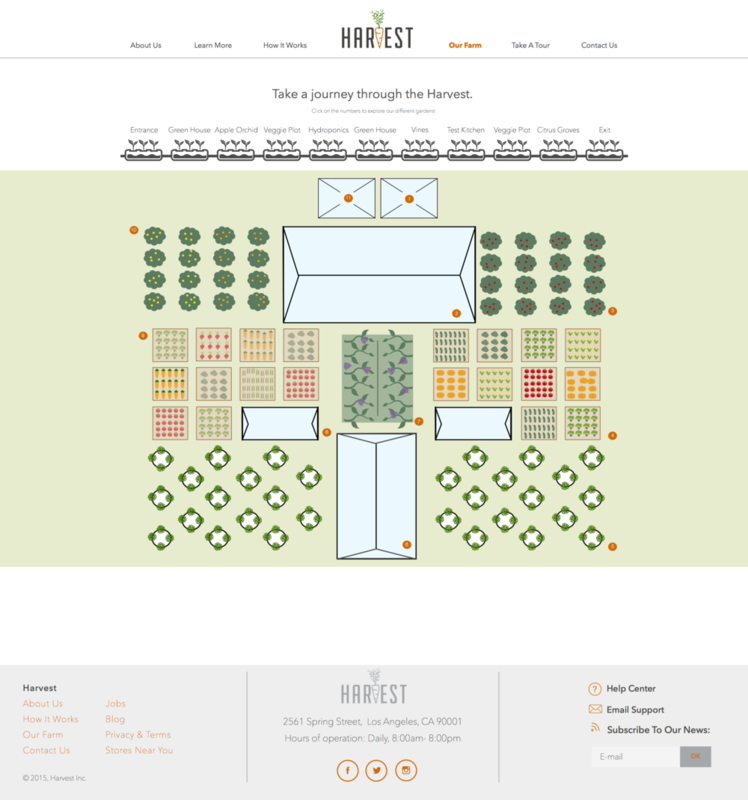 The Harvest is designed to improve local access to fresh food, promote a just and sustainable food system, while creating an unforgettable shopping experience. We started with rough lo-fi sketches on the whiteboard to capture what the site would include. Our next step was to translate our initial sketches into digital renderings. We made lo-fi wires using Sketch. Once we wrapped up our lo-fi wireframes, we were able to start creating our hi-fi mockups in Sketch. Our design aesthetic was intended to feel clean, modern, and approachable with a clear representation of our mission statement sitewide. We also created a video highlighting the ideation process and the main parts of the site. Harvest not only tackles the environmental issues but also changes the shopping experience by creating a deeper emotional tie to our food. We also created an infographic depicting visually on what our conceptual market would solve. This project posed many questions towards the end and had us considering the possible next steps. Take a closer look at the economics involved with developing and building Harvest. How could we create a business model that is accessible to people in all economic classes? Consult with urban farmers, landscape architects, and city planners to discuss the feasibility of the project…can it be done? What zoning regulations would we need to be aware of? 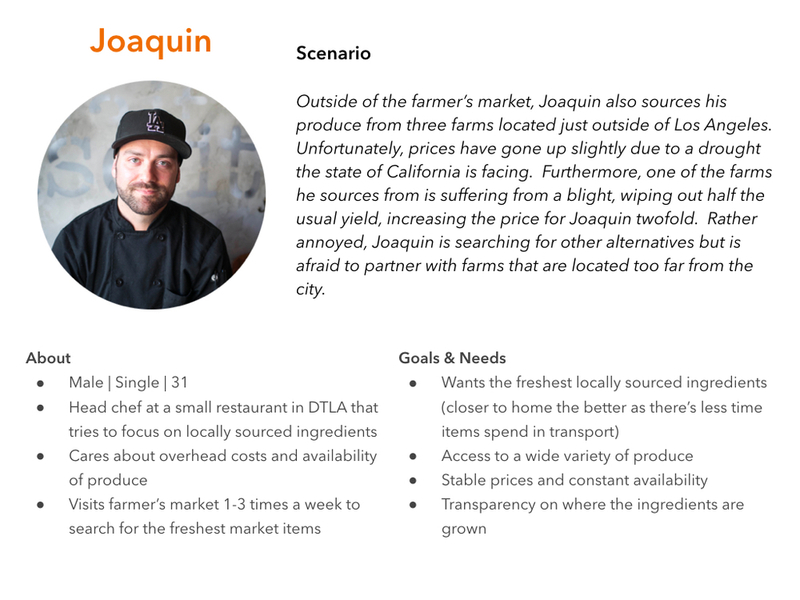 Explore the legalities and policies for a market like Harvest to exist in Los Angeles. From our field study, we learned that Santa Monica had a pretty aggressive and complicated structure set up for selling produce and food items. We would need to take a closer look at the policy structure that’s in place. Conduct more interviews to see what features of Harvest would be most beneficial to our target demographics. We would also need to explore the scalability of the project — how much would Harvest produce? Is it practical feeding a city? How would we overcome roadblocks such as running out of inventory? Definitely present this idea to the design community and garner feedback. This project really got us to think outside of the screen. An UX designer should not limit themselves buried within the world of apps or websites, but rather take advantage of their innate curiosity and creativity to take on any issue. Because at the end of the day, its the people that matters. It is the human interactions and experiences the UX designer should care most about. Its creating that connection, empathizing with users, using research to drive the next steps, and validating that makes UX design applicable everywhere.